Want To Know The 102 Best Products In The Homeschool Market? Cathy Duffy’s book, 102 Top Picks for Homeschool Curriculum, makes the job of selecting the right curriculum easy! It includes extensive reviews of each of her Top Picks. 102 Top Picks is a must-have for new home educators. Selecting the right curriculum can be a time consuming, heart-wrenching task for any family that chooses home education. Now, homeschooling curriculum expert Cathy Duffy makes choosing the right resources for your child easy in her book 102 Top Picks for Homeschool Curriculum. Cathy guides you through the process, offering her "Top Picks" from each subject area, narrowing down to a manageable number of choices. Parents no longer need to sort through the entire universe of products before they can find something suitable. In 102 Top Picks, Cathy simplifies the curriculum selection process with questionnaires and charts. She walks her readers through the process of figuring out their preferences in terms of a philosophy of education, learning styles, and goal setting. A major feature of 102 Top Picks is the charts showing the 102 Top Picks in relation to educational approaches, learning styles, and practical features such as prep time needed; design for independent, one-on-one, or group learning; and ease of use for the teacher. Complete reviews of each of the Top Picks provide parents the information they need to make the best choices for each of their children. NOTE: The print book is no longer available, but ebooks remain available. Cathy's newest book, How to Choose Homeschool Curriculum, retains the first five chapters of 102 Top Picks, giving you the tools to figure out which curricula will work best for you and your child(ren). Rather than our previous chart system in the book in chapter six, we have created an advanced search feature for this website which helps homeschoolers narrow down their choices from among all of my reviews. I will continue to identify my Top Picks on the website. The new book and advanced search feature expand your options. However, those new to homeschooling might prefer 102 Top Picks since it narrows down the range of choices to consider. For a detailed, unsolicited video review, see Tiffany's Simply Knowledge Homeschool blog at http://simplyknowledgehomeschool.blogspot.com. "Oh my goodness, what a calming & reassuring resource this has turned out to be! I have spent the last couple of years trying to get the hang of homeschooling but floundering the whole time. Yes I have read all the blogs and talked to many other homeschoolers, but it's hard to apply advice from one family's experience and expect it to fit my own. For the first time I feel like I have a solid direction to head, thanks to Cathy's careful guidance. She has helped me figure out my teaching style/preference as well as my daughter's style of learning. As with any form of lasting education, the proof is in the application. She helped me connect the dots between teaching/learning styles and the kinds of curriculum that support that. What a relief!! I am entering the new school year with a LOT more peace and confidence. Thank you, Cathy, for this invaluable resource." "I just wanted to tell you how your book set our homeschool off with success 4 years ago. I was so lost and even though I majored in Education, I still had no idea what curriculum to choose for our family. Your book was a crash course in educational philosophies and learning styles. AND gave us a mission statement that helped us not waste our time and money on curriculum that didn't support those goals. Every time a mom asks me about how to homeschool and where to start, I buy them your book and ship it to them via Amazon. Then I tell them to call me. I can't tell you how many I have bought! But your book is a wealth of information, I know I can't do a justice. I was having coffee with a friend a couple days ago and she said, "You know what book transformed our homeschool? 101-" And I yelled, "Top 101 Homeschool Curriculum by Cathy Duffy! It's so much more than the title! It totally equipped me in making decisions for our school too!" 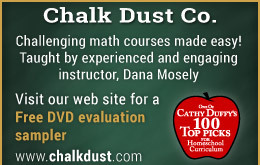 Anytime I see a new curriculum, I jump on your website. All that to say, thank you so much for your book! And the ongoing reviews for future curriculums. I honestly have no idea what I would do without them." "Cathy has saved me hours, if not days, of work! I am so grateful for her book. This year I was revamping all of our homeschooling books (either used up or needed a different style) and needed information for three different grade levels for eight different subjects! I was able to find what would work best for our family and each child individually all within her book. Even after I finished the book, I decided to check out some other suppliers. I was unhappy with them all; either quality, price, or content. I would end up back at what Cathy recommended every time. This has been EXACTLY what I was looking for. I really trust her reviews and love the outlook she shares within her book. I cannot tell you what a blessing this book was for me this year. 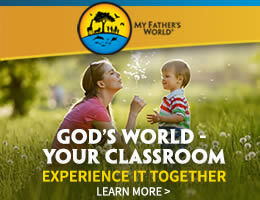 I am recommending it to all my homeschooling friends. Thank you!!!" "...I would buy it for myself or a friend without blinking. This is an invaluable tool, especially if you are just starting out. Even as I say that, I have been homeschooling for ten years and I am still getting excited about using Cathy's forms and reading through each section more carefully." "Top Picks assisted me in not only defining my style of teaching but how each of my children learn best. With the curriculum descriptions I was able to select and consider curriculum that would work best for my family saving me much time, money and frustration. I have suggested this book to many other homeschoolers and will always suggest this book to those just entering homeschool." 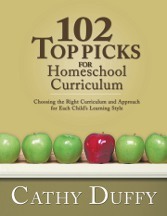 Buy the 102 Top Picks for Homeschool Curriculum today!